This is an easy variation on the Scottish dessert, clootie dumplings. 'Clootie' refers to the cloth that the fragrant mixture was traditionally steamed in. Preheat the oven to 180°C, gas mark 4. Cut 6 x 15cm squares of foil, grease one side of each foil square with butter and then grease 6 x 175ml mini pudding basins. Place the mixed fruit and 150ml of the whisky into a small saucepan and bring to the boil over a high heat. Cook for 1 minute, remove from the heat and leave to stand until completely cooled. Sift the flour and baking powder into a large bowl. Add the butter, sugar and eggs, then whisk with an electric mixer until smooth and creamy. Fold in the cooled mixed fruit, along with any sticky pan juices. Divide the mixture between the prepared basins, and top each one with a square of greased foil, buttered side down. Wrap tightly, place the basins into a roasting tin and pour in just enough boiling water to come about half way up the sides of the puddings. Bake in the oven for 30-35 minutes, or until springy to the touch. Remove the puddings from the tin and serve immediately, or leave to cool with their foil covers on. Heat the custard according to the instructions on the tub. Add 2 tbsp of whisky, or to taste. Loosen the edges of the puddings with a knife and invert onto plates. 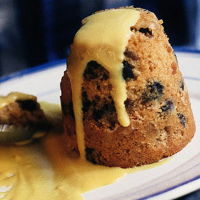 Serve with the boozy custard spooned over.